This chapter focuses on how the principal adversaries in this protracted conflict view themselves—their rights, objectives, and methods to achieve them, along with their views of “the other.” Jewish national identity was sustained for more than three millennia by a distinctive and unifying belief system, Judaism. Only in the last half of the nineteenth century did Jewish communities in Central and Eastern Europe begin to imbibe the ideology of modern nationalism, emanating from revolutionary France. A distinctive national identity emerged among the Palestinians much later than among Jews or other Arab nations, notably Egypt and Lebanon; for the Palestinians, the ideas of self-determination and independence date to the late 1930s, the period of the Arab Revolt (1936–38). 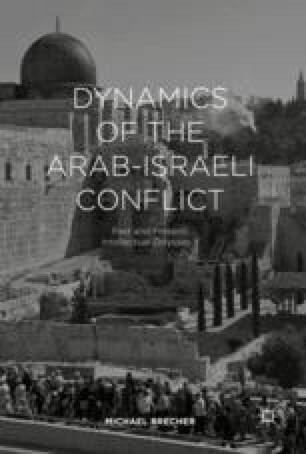 The core elements of Israel’s attitudinal prism—the lens through which perceptions of reality are filtered—have applied to all Arab states for most of the period since 1948. One is a belief in pervasive Arab hostility to the idea of a Jewish state in the self-designated Arab spatial domain, the Middle East. Closely related is Arab unwillingness to recognize Israel as a legitimate state. The two exceptions, Egypt in 1979 and Jordan in 1994, are treated, in Israel’s prism, as pro forma recognition of reality—“the State of Israel exists.” Another prismatic component is the Jewish People memory of catastrophes in thier history, the latest trauma being the Holocaust, which ended only three years before the proclamation of Israel’s independence. The dominant element of the prism, which has shaped Palestinian perceptions among the élite, the attentive public, and the mass public, has been captured most powerfully among Palestinians by the emotive Arabic word al-Naqba, that is, the catastrophe, identified with Israel’s proclamation of independence on 14 May 1948 and what for Palestinians is the ultimate iniquity of Israel’s occupation of most of the territory perceived as morally and historically part of Palestine’s patrimony. Despite the substantial differences in policy and tactical behavior between the two most influential and, more often than not, mutually hostile political organizations within the Palestinian national movement, Fatah and Hamas share the core elements of the Palestinian attitudinal prism, as do most of the competing Israeli political parties in the essence of the Israeli prism with regard to the Palestinians.